Did you know: 8 out of 10 impulse purchases are made in brick-and-mortar stores. If you stopped and thought about it, that’s a pretty amazing statistic. The better news? There are effective in-store marketing strategies on how businesses attract customer attention available right now that can help your business draw in more foot traffic and wheel in more impulse purchases. 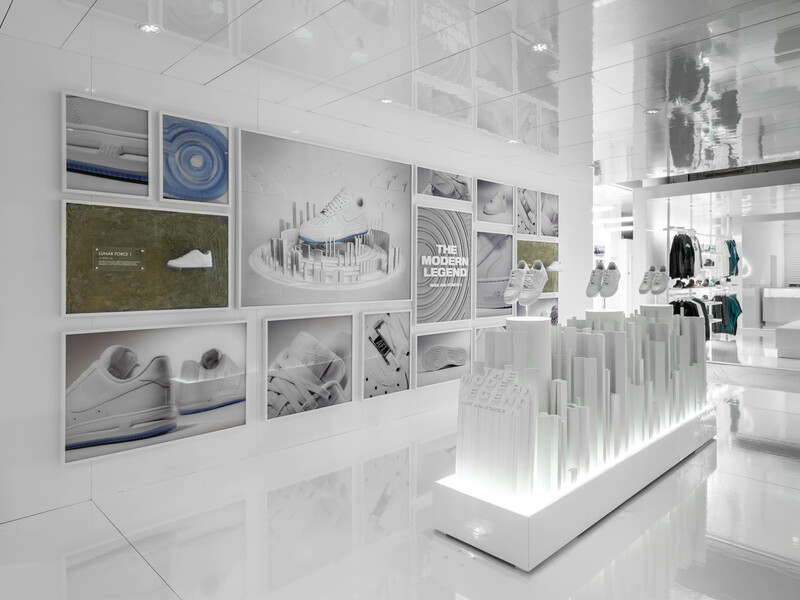 Below we highlight 12 New York City in-store retail marketing examples that have been used by reputable brands in the past. Feel free to take a gander and even “borrow” a few ideas for yourself. Why In-Store Marketing Is So Important? With the rise of eCommerce, brick-and-mortar retailers today have to offer customers something more than the typical digital experience. In the flesh, all senses are triggered and the shopping experience is completely different, you get more chances to inspire action. The average shopper will make 3 unplanned purchases in 4 of every 10 store visits. Without suggestive marketing triggers planted throughout the in-store customer journey, businesses miss out on easy opportunities to increase sales. Unfortunately, a lot of business owners today are unaware of the potential of suggestive marketing and are oblivious to fundamental tactics that help stimulate impulse purchases. Draw curious eyes and customers into your store with custom vinyl prints. In this in-store marketing example, we show a vinyl background reflecting neon purple light. The contrast of the background and the white spotlight mesh well as it lights up the torso and dress, making the mannequin stand out that much more for that special someone ready and willing to buy on a whim. 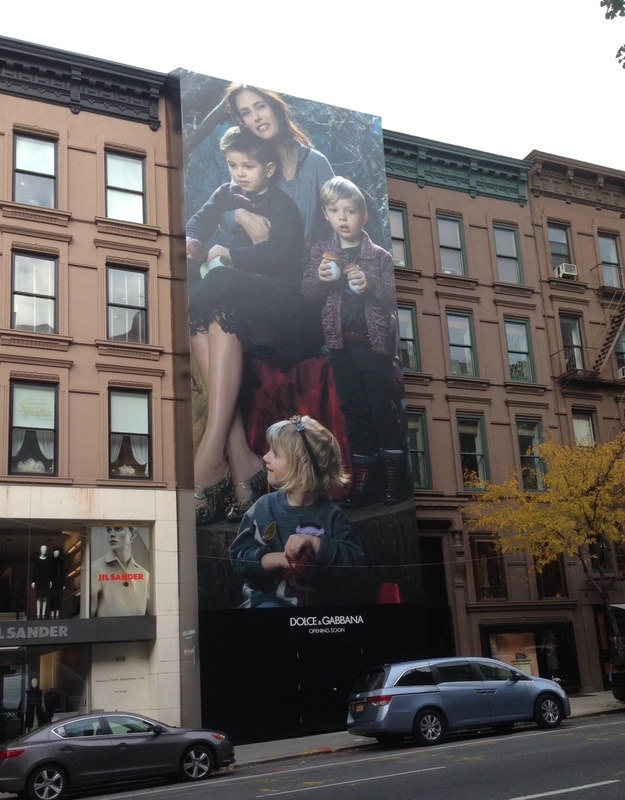 You can digitally print large scale canvases of models wearing a new collection 24/7 in your store. Victoria Secret does an excellent job at many things and posterizing their models is one of the many. Notice how their sultry eyes lock with anyone who walks by — you can’t help but look and appreciate the content. With every new season, there’s a new reason. 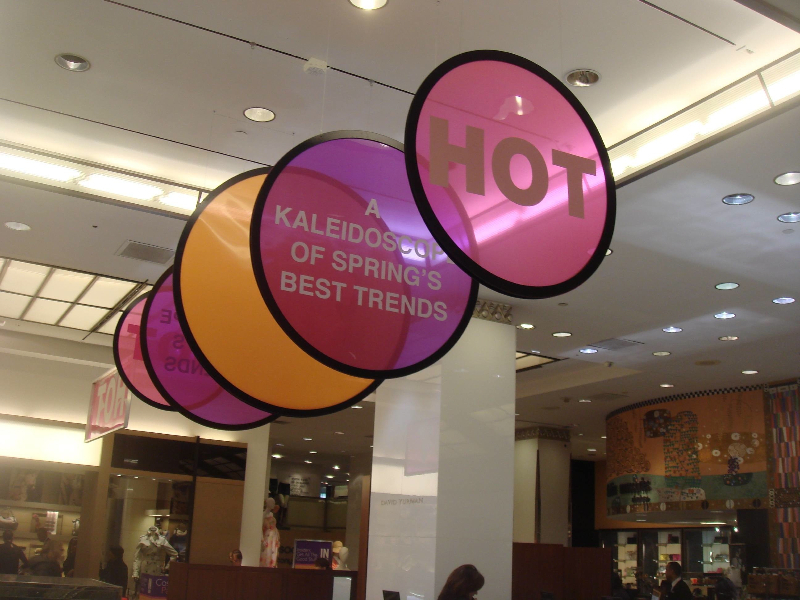 Here we have a spring fling in-store marketing campaign courtesy of Bloomingdale’s. The custom telescopic graphics display hang from the ceiling and are certainly hard to miss. Bright, concise, and compatible with the colors of spring, hoisting up festive large format prints is a great way to get customers to view all that is “hot” in your store. Bigger is often better in in-store marketing. You really can’t go wrong with floor-to-ceiling wall branding. 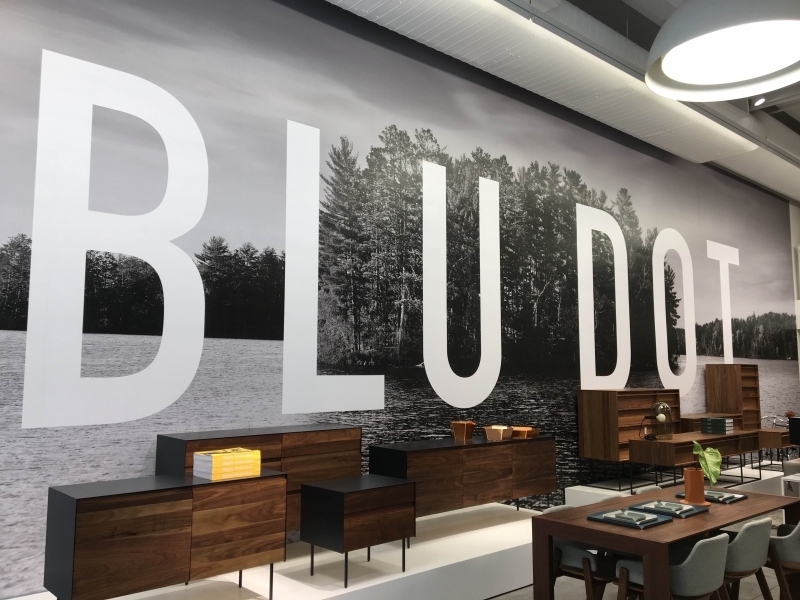 Blu Dot is a modern furniture store based out of Minneapolis with locations across the globe, including NYC. This digitally printed white, grey and black wall hint towards a forest-to-table theme, ultimately making their products pop out by cleverly hinting at a before-and-after. There are a lot of interesting in-store marketing ideas that any brand can implement. In this retail sports store example, This image draws the attention of their customers using different shapes and materials and imagery. 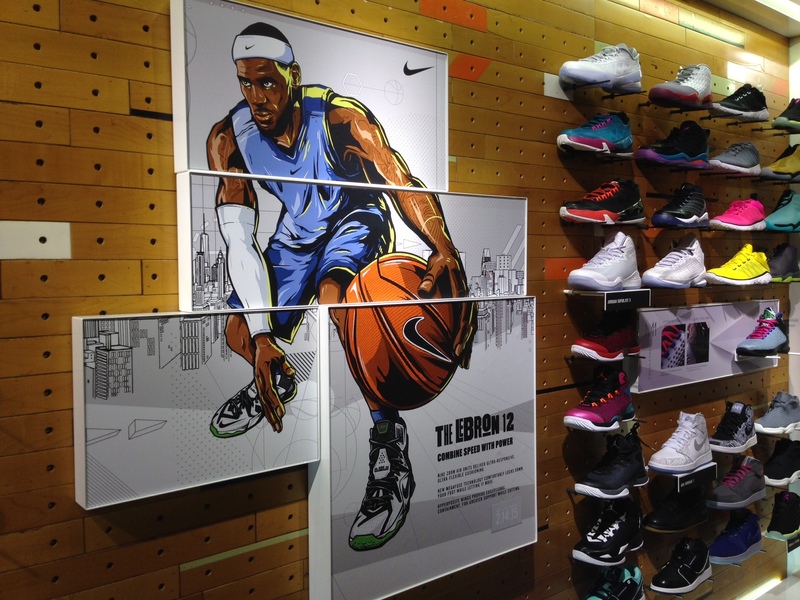 This digitally printed magnet piece highlights a digital Lebron James sporting The Lebron 12 next to a stack of Nikes. Pop-up stores are popping up everywhere, and are a growing trend in the market, some call it the Uberization of retail. Pop-ups are a great way to increase awareness, generate buzz about a new collection, and increase sales while minimizing overhead costs. 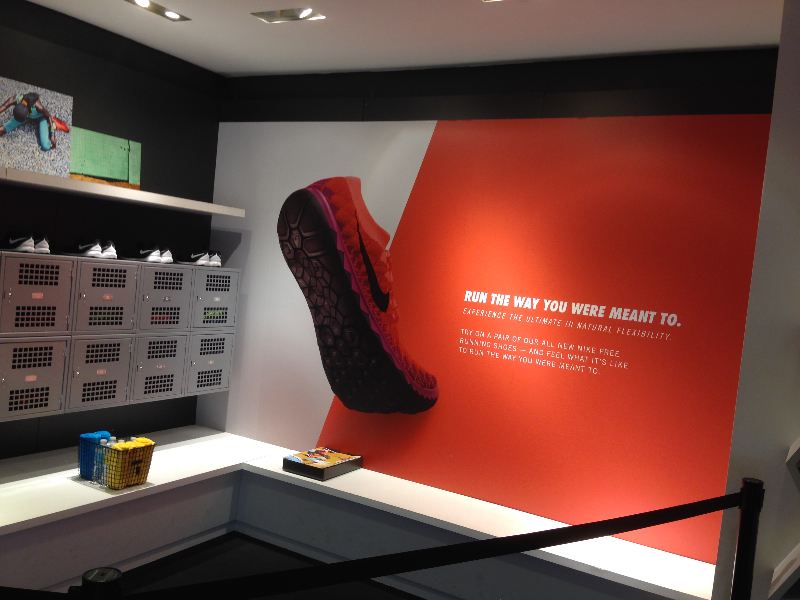 Here we have large format graphics in a Nike pop-up, beautifully showcasing their products. With in-store marketing, you want to make the best out of every location possible. Here we have a large print showcasing Nike’s latest running shoe featuring tagline “run the way you were meant to” right next to a bench and shoes. Notice how the light shines on the red and black and how the contrasting colors add that extra pop. Clever and effective. Post up as many marketing triggers near the check out as possible and suggest as many products while customers wait in line. Here we have a large graphic of a yellow-haired model wearing a yellow jacket looking straight into your soul, almost as if the coat and she are popping out of the wall, all spotlighted in white light. And see how convenient: There’s a display of sunglasses right next to her; you know, in case it gets too bright for you. A great way to pull in customers into a department is with in-store cuts that can cover pillars and slide onto tops of kiosks or hanging frames. 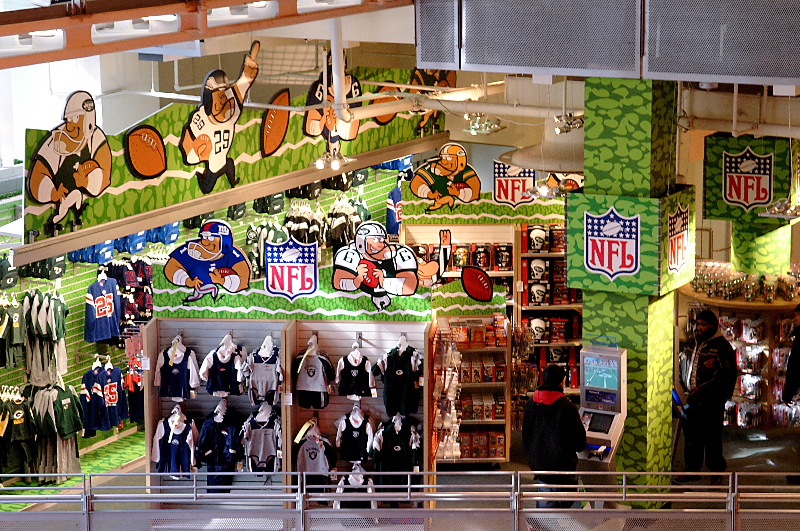 The NFL does a good job here with this in-store marketing example, decorating a bland corner like it was a football field packed with player merch. Without question this resonated with their target audience, you really can’t miss a green field in a shopping mall filled with white tile and white backdrops. Stairs offer a unique opportunity for businesses to grab the attention of customers and are often overlooked. 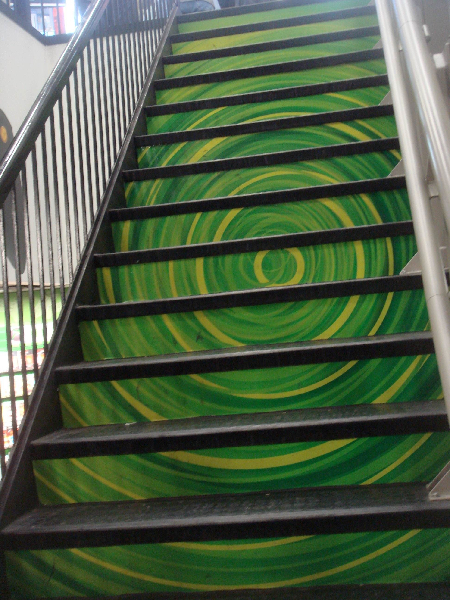 Here we have green and yellow prints in between stairs that form a large swirly whirlwind that hypnotizes foot traffic into walking up into the store; inspiring a sense of mystery and sparking curiosity, exactly what you want in a large stairway graphic. If you can add an Instagram-worthy moment in your store, do it. It engages with your audience and gives brands free and hopefully viral publicity. Breaking convention has always been an effective way to get noticed. 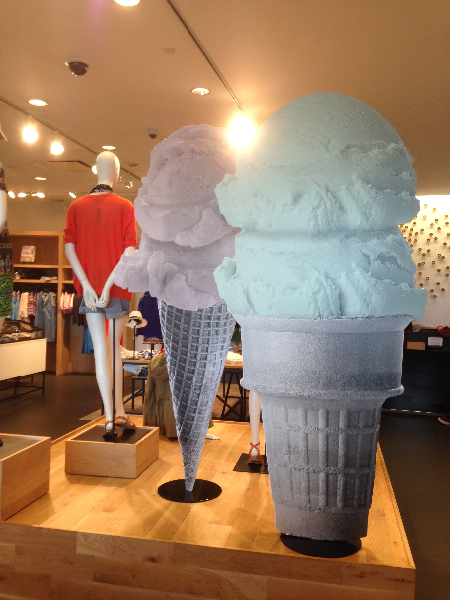 Here we have a NYC retailer adding ice cream cones next to mannequins, a strategically placed sweet magnet that hopes to draw in all those who pass by. You can directly print large format graphics on a board and contour cut it into shape like what we see here — brilliant. Entering and navigating through large department stores can get a little overwhelming at times. A great way to provide a positive customer experience is by effectively labeling isles, getting customers to where they need to be as fast as possible. Vinyl banners do a great job at highlighting products in a large and crowded store, which makes it easier for both customers and employees. Every retail store should leverage every opportunity that it can to attract customers and inspire them to buy. Whether you use large format murals or bright shiny neon lights or cash out triggers or large printed magnets and cut-out boards, the ideas mentioned above are seen across New York City for good reason: they work. 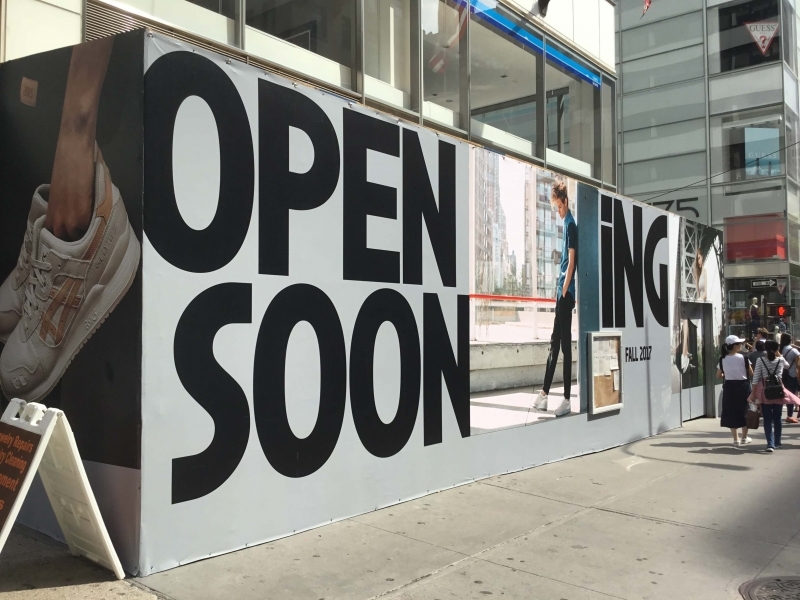 If you have any questions about in-store marketing in New York or looking for a company that can help with large format printing in New York City, feel free to contact us. Construction barricades and sites can be a hassle for business owners. They are ugly, noisy, turn off foot traffic and prevent impulsive buyers from visiting your store — it’s a disaster. But who says that you can’t turn an unfortunate construction crisis into a larger-than-life marketing advantage? At Color-X, we love oversized banners, advertisements, building wraps, wall murals, presentation graphics, flags, fencing, print point-of-purchase displays, decals, wearables…We know large prints make a big impact. And among dust, debris, and dins, wide format printing is an effective way to showcase your brand and make it stand above all others. In the middle of renovations, construction barricades are an opportunity to go big with larger than life prints. Wide format printing is an increasingly popular form of marketing that allows businesses to leverage large images, texts, and graphics, that can be seen from a distance. So if you’re looking to draw attention and pique curiosity from potential customers during construction season, large format printing helps you make the best out of a horrible situation. 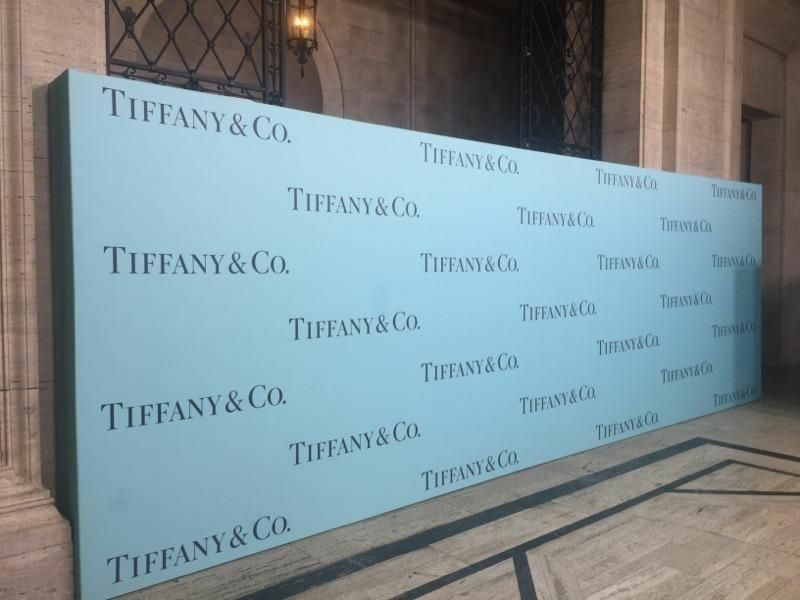 Below we highlight 6 examples of how reputable brands in NYC have used large format printing for construction barricades to their advantage. Shoewear and sports equipment brand Asics shows us how to turn a hideous construction barricade into a brand magnet. Large format printing is widely used for retail purposes in variable ways. One of the most popular cases is when brands subscribe to prints for construction barricades during pre-launch. The obvious option is to use a large print outside your store to market your products and create a buzz in the neighborhood. Michael Kors is a fashion designer and he and his brand designs and sells ready-to-wear watches, jewelry, fragrances, and footwear. 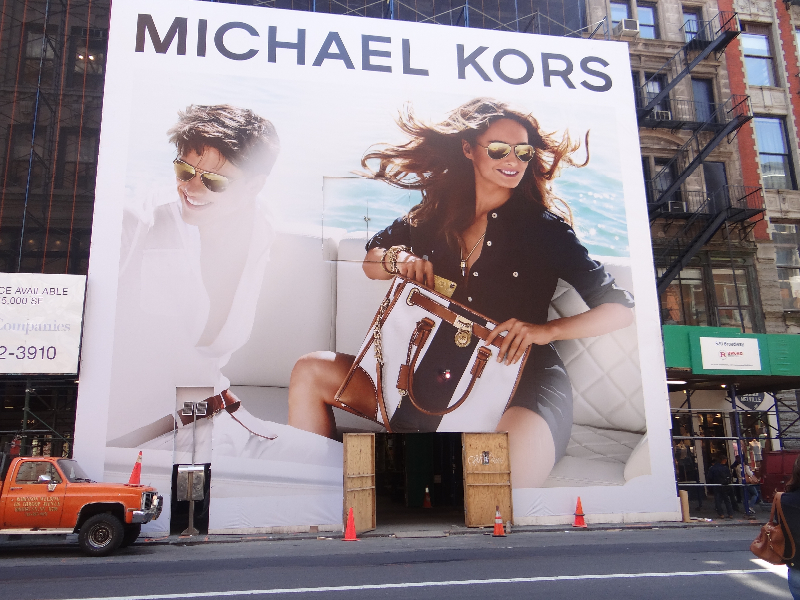 Here we have an example of a Michael Kors NYC location effectively using an unsightly construction space to form a larger-than-life magazine ad, covering his whole storefront — exactly what businesses should want in a large format print. Another great way to generate buzz and create awareness around your brand is to position yourself in a high-traffic intersection. Feel free to even go the extra block and plaster large prints on all main streets. 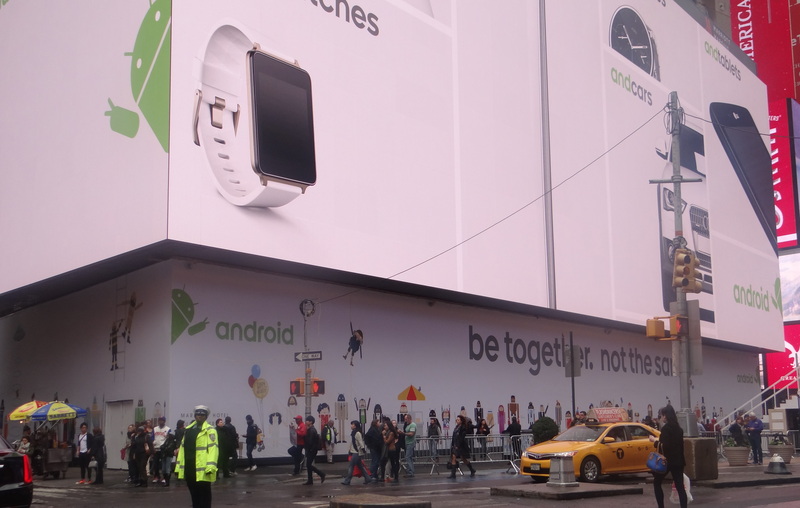 Here’s an example of Google’s Android wrapping up their construction barricade with large prints; showcasing their latest releases to both auto and foot traffic. 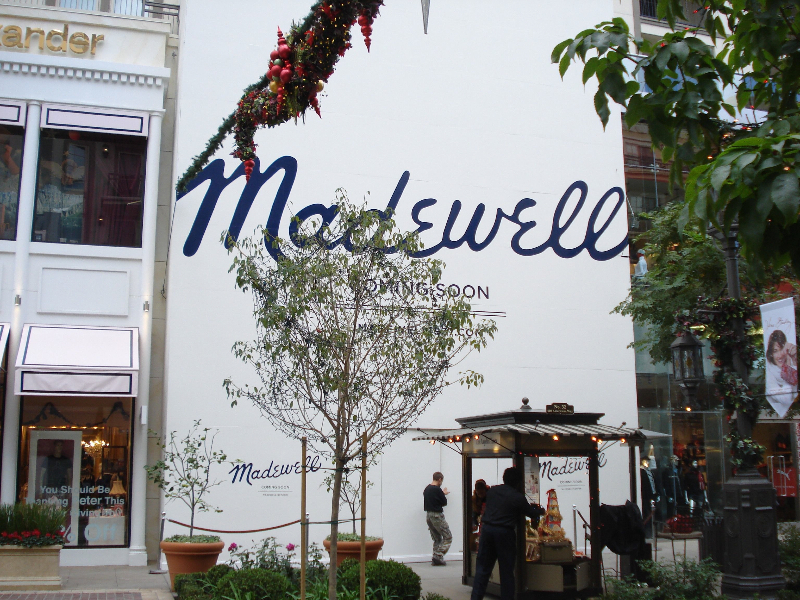 Madewell is a women’s clothing line that sells bags, shoes, jeans and more. Their minimalist floor-to-roof print adds a trademark touch of sophistication to the existing background; transforming their construction barricade into what appears to be a thoughtful gift wrapped for the neighborhood. Wall murals can be deployed inside or outside a business space and are a fantastic way to fill the empty space on a large construction barricade. 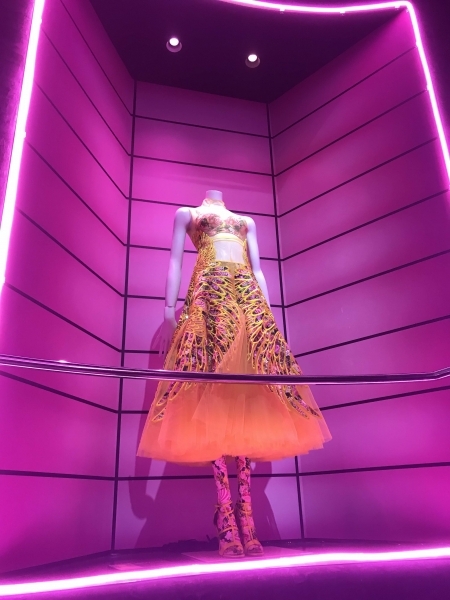 Dolce & Gabbana is an Italian luxury fashion brand that sells womenswear, menswear, childrenswear, eyewear and more, so it’s only fitting that we see them setting up shop on Madison Ave. 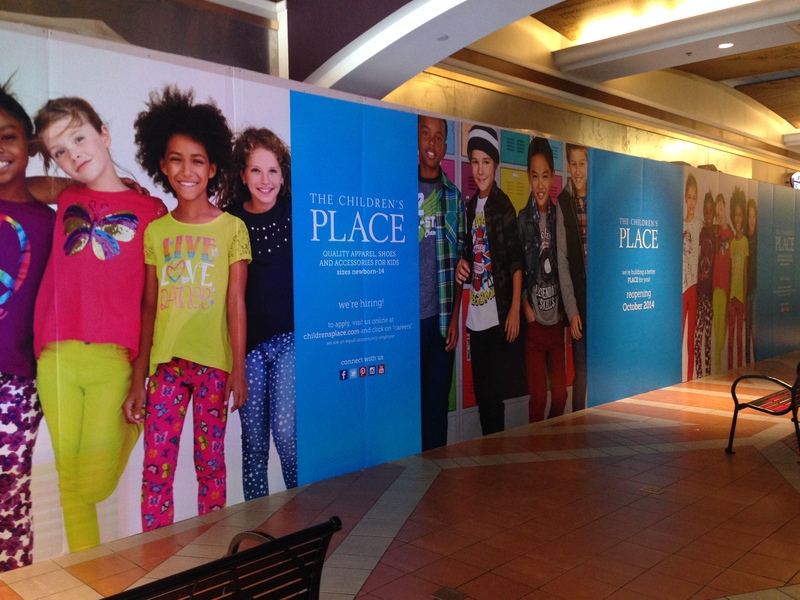 Remember: Large format printed retail barricades can also serve as eye-catching marketing opportunities. Here Dolce & Gabbana created a large graphic that stretches on one of the busiest shopping streets in the area — location is everything. Mall stores and brands typically do a good job with pre-launch marketing. Here we have The Children’s Place, a specialty retailer for children apparel and accessories, using a long stretch of construction barricade as a recruiter while also promoting their brand and products. While the above examples represent popular tools and methods on how businesses use this type of printing, that list is growing, and large format printing is constantly evolving. A joint study conducted in 2011 by FESPA and InfoTrends found that the world of large format print marketing using signs and banners is developing at an astonishing rate. Now that you have a better understanding of the benefits of large format services for marketing collateral and what a high-quality sign in the right location can do to bring in new business, let’s review the main elements to consider prior to creating large signage below. The place where you decide to display your printing will affect both the materials you choose for your project and what types of text and imaging you use. If you need signage for the inside of your retail store, you’ll require a very different version than the kind that has to draw attention from all the way across a tradeshow floor. Although large format printing services always provide better visibility, don’t take this aspect for granted. Think long and hard about where your viewer will most likely be when they first lay eyes on it. Then you have to consider what kind of materials will give you the best chance of success – both in drawing attention and maintaining its look over time. Printing can now be done on a myriad of materials, making the applications of large format printing virtually limitless so every business can get exactly what they need at a reasonable price. The world’s best large format signage isn’t going to do your company any good if you can’t actually implement it. So before you place your order, make sure you can install it on your own or that you’re working with a large format printing company that can do so for you. Where To Get Large Format Printing For Construction Barricades In NYC? We provide solutions for large and small retails for prints of any size imaginable. We’re highly skilled in large format, digital printing and offer project management which includes, site surveys, printing, and installation. While this guide should leave you better informed on large printing for construction barricades, we understand that you have a unique business with unique needs. The design, printing, finishing, and display size of large format print advertisements will always vary depending on your company’s specific needs. If you’d like to learn more about how Color-X can help you make the most of these services for your company – including taking care of installation — feel free to contact us today. Color X helps NYPL celebrate 50 years ……. 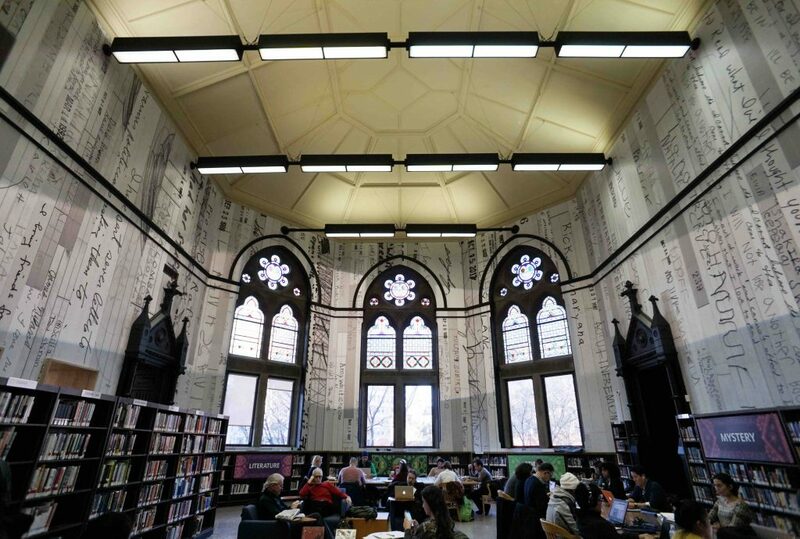 The recent 50th anniversary of the Jefferson Market Branch in NYC called for a BIG celebration . Color X was called upon to take over the entire space transform the room . The room filled with architectural detail and 40 foot ceilings was an enormous challenge for printed wallpaper and installation , we carefully took precise measurements of the space taking in to account any possible trouble spots. Files preparation was done to our site survey . We selected a permanent vinyl adhesive wallpaper to print on with a matte lamination. Panels were printed to include bleed and overlap so all panels would align . After the printing was finished is when the fun began , With a 2 day window to complete the install , we worked continuous shifts for 2 days of a crew of 8. Not only did we install the vinyl wallpaper we also painted one wall and all detailed moldings. The project was finished just in time for the grand opening cocktail party which was a huge success as the room was completely transformed . Now more than ever retailers need to create environments with strong and visually attractive impact. Printing on fabrics large scale is a great way to make this happen. there are many great options of fabrics to choose from . All adding a little more elegance to the space. Fabric printing can achieve excellent quality through dye sublimation and also now direct printing to materials. The color saturation and detail is quite amazing . 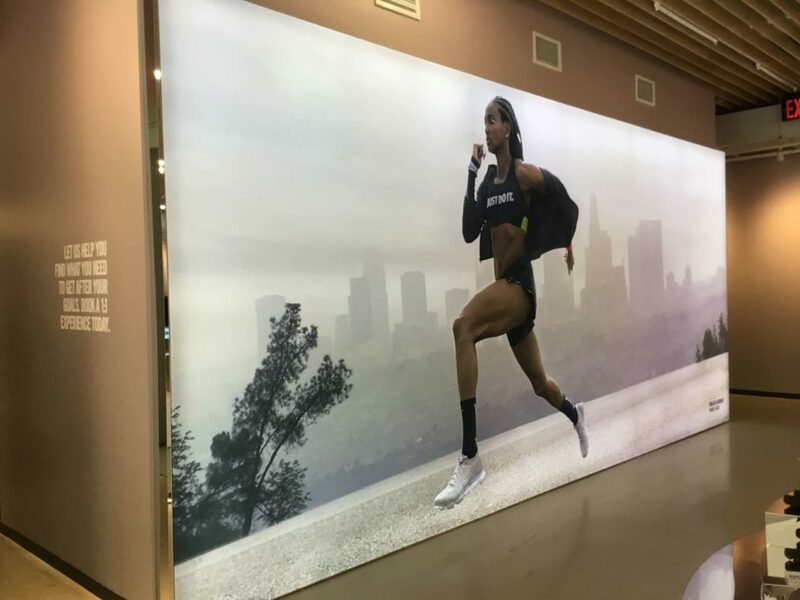 Fabric graphics brings versatility as images can be displayed by hanging from above , inserted in to SEG frames for seamless wall murals , or wrapped and displayed in many other ways . Another great way to use fabric is to backlight , the light source behind really pops the image and especially at night stands out. When deciding what materials to use for store roll outs fabric should be considered as it is inexpensive to ship and also more durable than other options. Beyond retail , fabric banners are great for events, corporate spaces , museum exhibits, trade shows, and more. Lets discuss how we can help with your next print project. Large format graphics are everywhere. From in-store displays promoting to-die-for products to waving banners at international trade shows to family portraits hung on hallway walls, you can find them anywhere in any city. They are printed out and used by all the reputable brands and certainly do add a magical touch to any environment. We’ve seen just about everything when it comes to graphics. So if you’re looking for the best way to make the most out of large format printing, whether it be making graphics for your next marketing campaign or for something a bit more personal at home, below we highlight our favorites for you to check out. So first of all, how did large format graphics get so popular? Large format graphics started to move into the mainstream during the digital boom in the early to mid-90s. With digital fine art photography growing in popularity, the transition from film cameras to digital cameras led to a trend and demand for large format printing. By the first decade of the 2000s, everyone was printing in large format, from schools to sports teams to rock stars to Fortune 500 brand names, the transition from film photography to digital was inevitable. Here we take our best examples of brands using large format graphics for both indoor and outdoor use. Take a look and let us know what you think in our comments section below.